A hypnotic beauty, the Reina gold pearl wedding crown is an opulent and feminine hairpiece. Rich in textured botanical detailing, its gold sculptural blooms are set onto delicate beading details. It’s a striking piece that beautifully merges regality with a touch of bohemia wonder. Designed for the bride with a love of nature and the sea, its fine detailing reflects an admiration for Mother Earth and the beautiful natural elements that can be foraged from the wild. Handcrafted with a dedication of time and love, its elements were harmoniously transformed into this striking and enchanting headpiece. The Reina crown is made to order. Please allow 4-6 weeks for production plus delivery times. The Reina crown is an evocative piece that’s striking, moody and ethereal. Reina is exquisite on its own or style it with a veil for a look that’s enchanting with a regal flair. 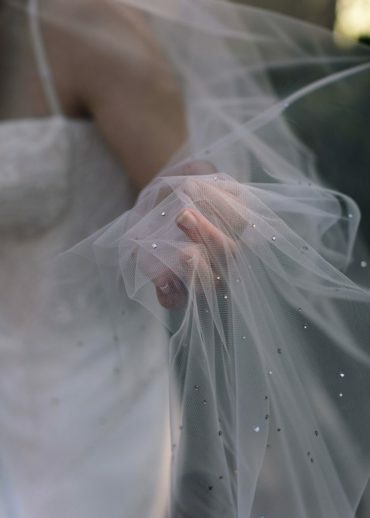 Reina can be styled with a full gathered veil or a simpler drop veil in fingertip, chapel or cathedral length. Our favourite pairings are the Blair, Rosella and Louvre veils. For a look that’s next level, pair the Reina with the Etoile or Margaux crystal veils. Browse our full veil collection or contact us and we’d be happy to offer a recommendation based on your wedding dress and hairstyle. We love to design our wedding crowns for wedding dresses with open necklines – including off the shoulder, low fronts, low backs, cap sleeves. It can also suit long lace sleeves and high necks, depending on the gown and lace patterns. We love to style Reina with all romantic hairstyles – it sits securely in loose curls, can be worked into low set buns, and is the perfect finishing touch to half up hairstyles.